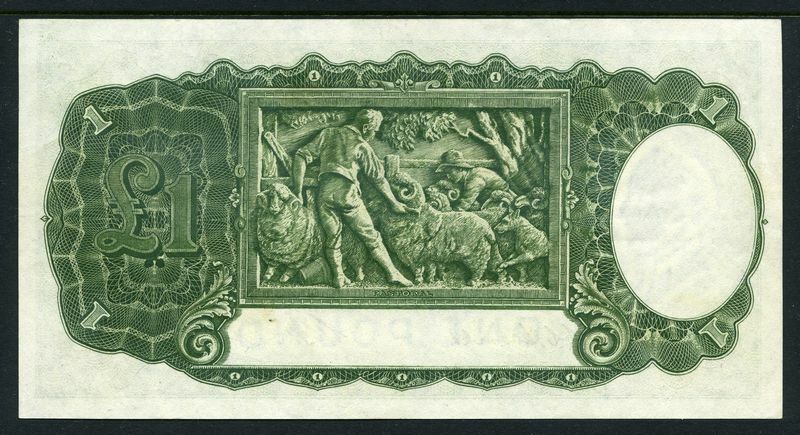 1939 £5 Sheehan/McFarlane, 1949 £1 Coombs/Watt and 1952 10/- Coombs/Wilson KGVI banknotes in low grade condition, plus 1972 $20.00 Phillips/Wheeler banknote (2) F. McDonald 23, 48, 67 and 184. 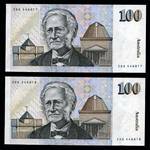 Also small range Foreign banknotes. 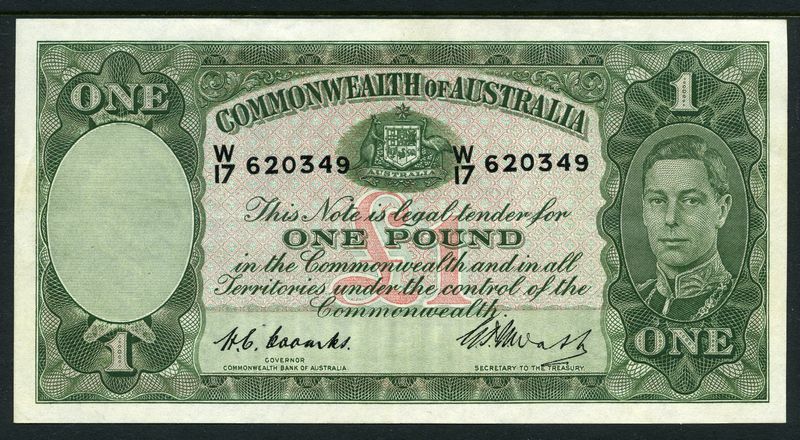 1941 £5 KGVI Armitage/McFarlane VG, 1942 10/- KGVI Armitage/McFarlane gVF, 1949 £1 KGVI Coombs/Watt EF, 1954 10/- Flinders Coombs/Wilson Commonwealth Bank F and 1961 QEII Coombs/Wilson Reserve Bank with emerald green reverse VG (2) banknotes. McDonald 21, 24, 48, 52b and 68. 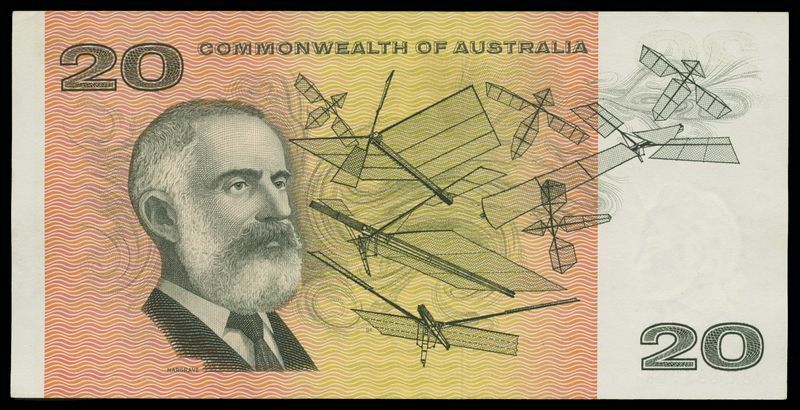 Also 1982 $1.00 Johnston/Stone banknote aUnc (9). 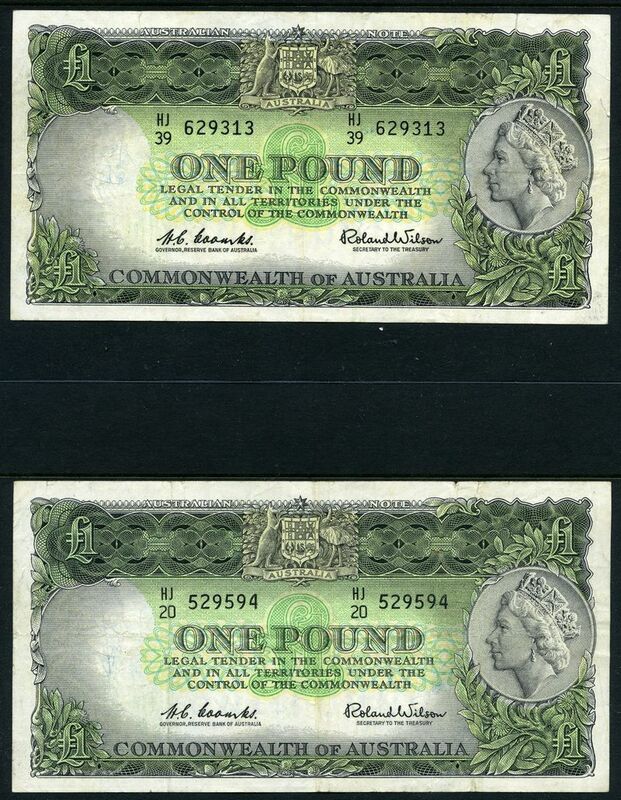 1942 £1 Armitage/McFarlane KGVI dark green main print F, 1961 Coombs/Wilson Commonwealth Bank QEII VF, 1966 $10.00 Coomb/Wilson F (1) and VF (3), 1968 $10.00 Philips/Randall consecutive pair EF, 1966 $20.00 Coombs/Wilson VF, 1968 $20.00 Philips/Randall VF and 1972 Phillips/Wheeler Commonwealth of Australia F banknotes. 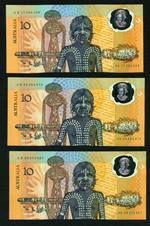 Also 1988 $10.00 Bicentennial Polymer Banknote folders (2). McDonald 46, 51, 161 (4), 163 (2), 164 (1) 181, 183, 184 and $10GF 1 (2). Catalogue Value $591.00. 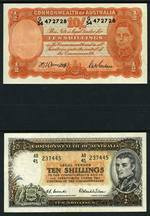 1927 £10 Riddle/Heathershaw Banknote VF. A flat note which we would have graded aUnc, were it not for light water stains and fading in some areas. Serial No U3 359169. Catalogue Value $4,200.00. 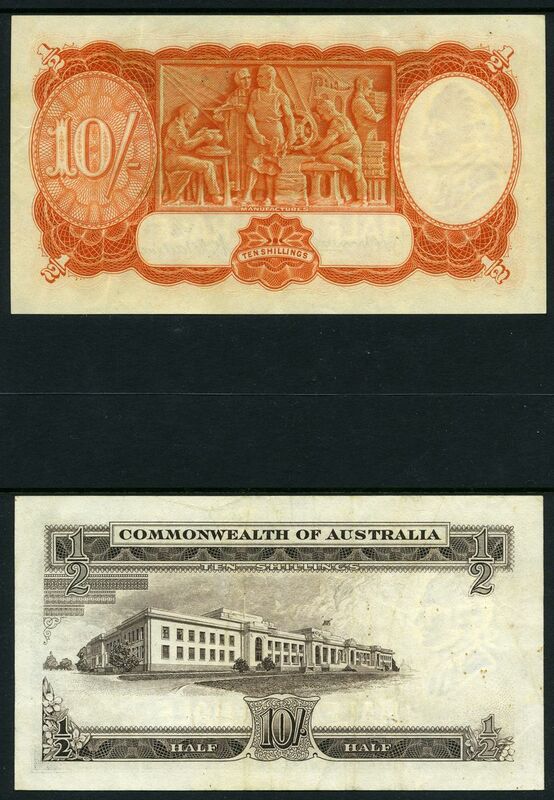 1982 $1.00 Johnston/Stone bundle of 100 banknotes with consecutive numbers and Reserve Bank band Unc. Serial Nos DJL 444799 - DJL 444898. 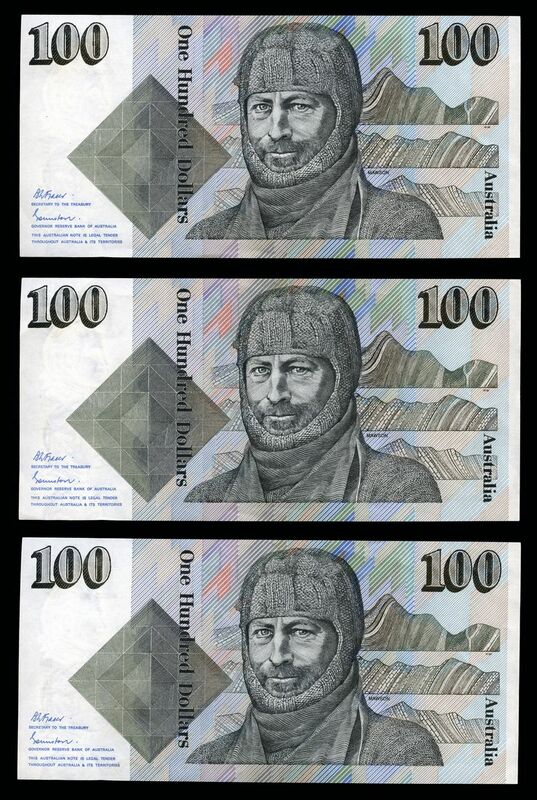 1982 $1.00 Johnston/Stone bundle of 100 banknotes with consecutive numbers and Reserve Bank band Unc. Serial Nos DLV 262916 - DLV 263000 and DLX 262501 - DLX 262515. 1982 $1.00 Johnston/Stone bundle of 100 banknotes with consecutive numbers Unc. Serial Nos DNZ 756700 - DNZ 756738 and DNZ 756740 - DNZ 756800. 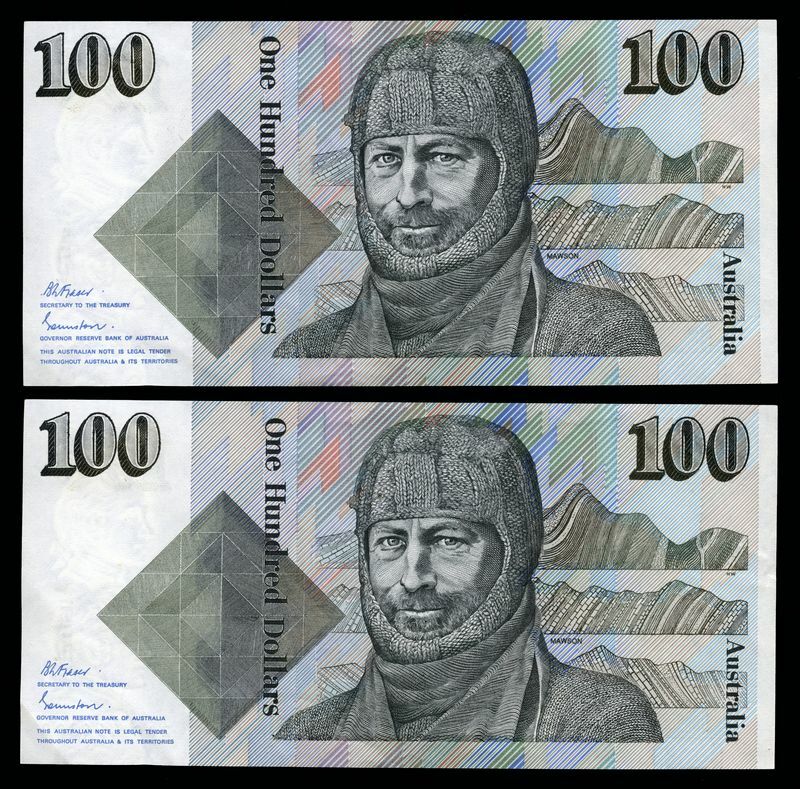 1982 $1.00 Johnston/Stone bundle of 100 banknotes with consecutive numbers and Reserve Bank band Unc, including Radar Note 271172. The last note in the bundle has small crease. Serial Nos DLR 271123 - DLR 271224 excluding 271167 and 271184. 1985 $2.00 Johnston/Fraser bundle of 100 banknotes with consecutive numbers and Reserve Bank band Unc. Serial Nos LHZ 460823 - LHZ 460922. 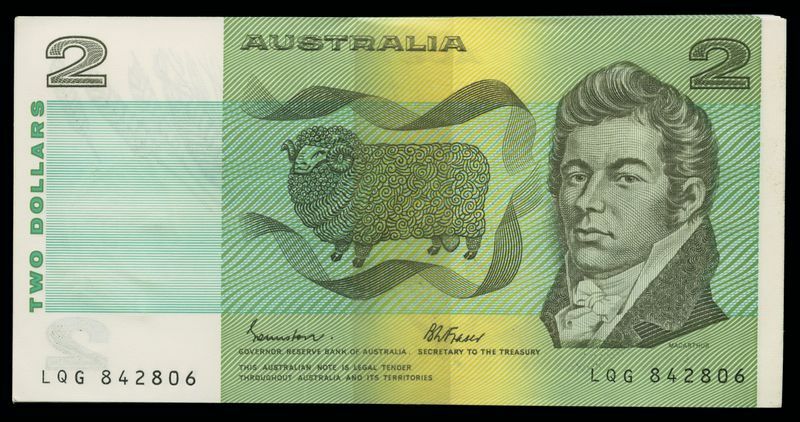 1985 $2.00 Johnston/Fraser last prefix LQG bundle of 100 banknotes with consecutive numbers and Reserve Bank band Unc. Serial Nos LQG 842806 - LQG 842906 excluding LQG 842877. Catalogue Value $8,000.00. 1988 Bicentennial Coin and Note collection containing $2.00, $5.00 and $10.00 coins, $2.00 and $5.00 Paper notes and $10.00 Polymer note in presentation folder. 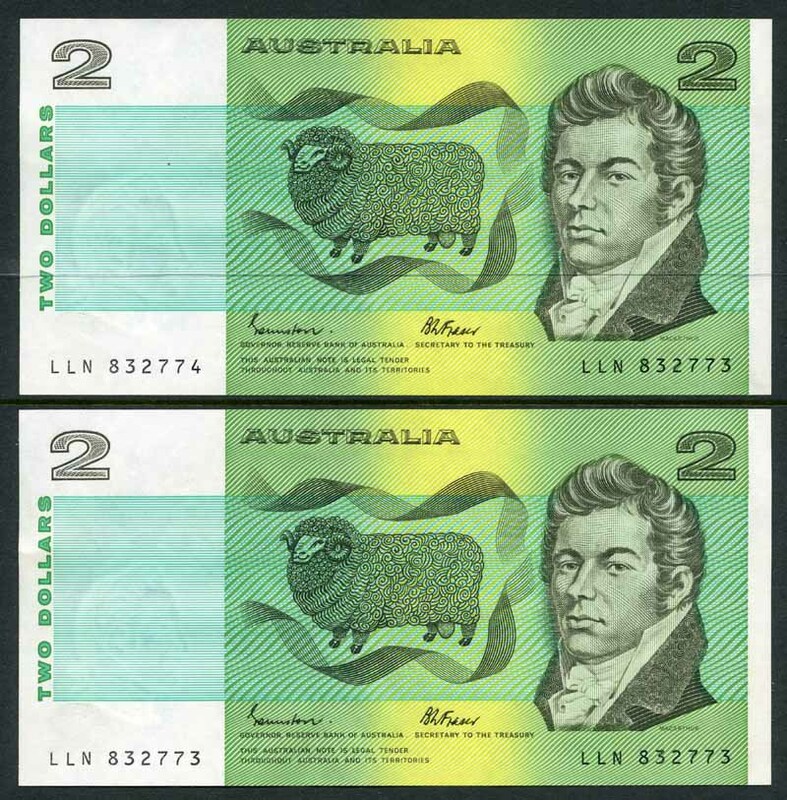 $5.00 Serial number QAH 013863, the $2.00 note with last prefix LQG. 1967 $5.00 Coombs/Randall NAA First prefix gVF, plus additional general prefix and 1969 $5.00 Phillips/Randall banknotes VF. 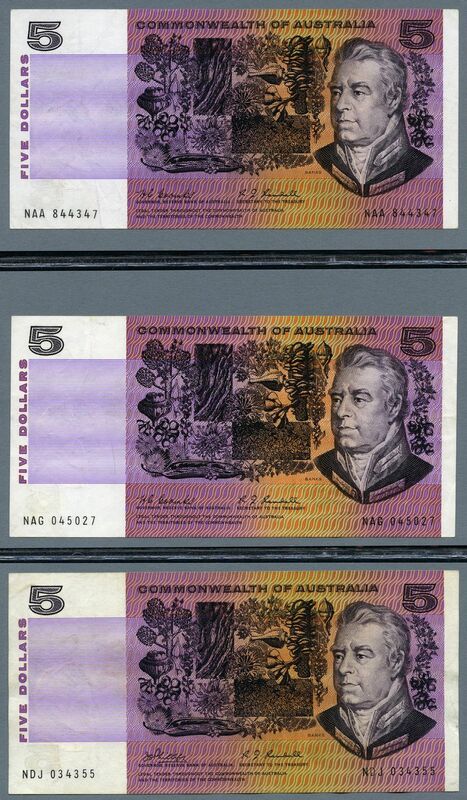 1985 $5.00 Johnston/Fraser paper banknote with OCR-B serial numbers. Has a number of White streaks on both sides of the note, caused by a pre-printing paper crease. Unc apart from the creasing associated with the variety. Serial No PXB 773069. 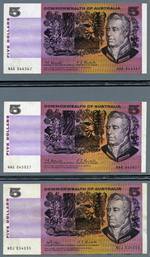 1992 $5.00 Fraser/Cole Polymer banknote in mostly consecutive run of 10 with medium to dark Green serial numbers Unc. Serial Nos AA 71 362645 to 362655 excluding 651. Catalogue Value $450.00. 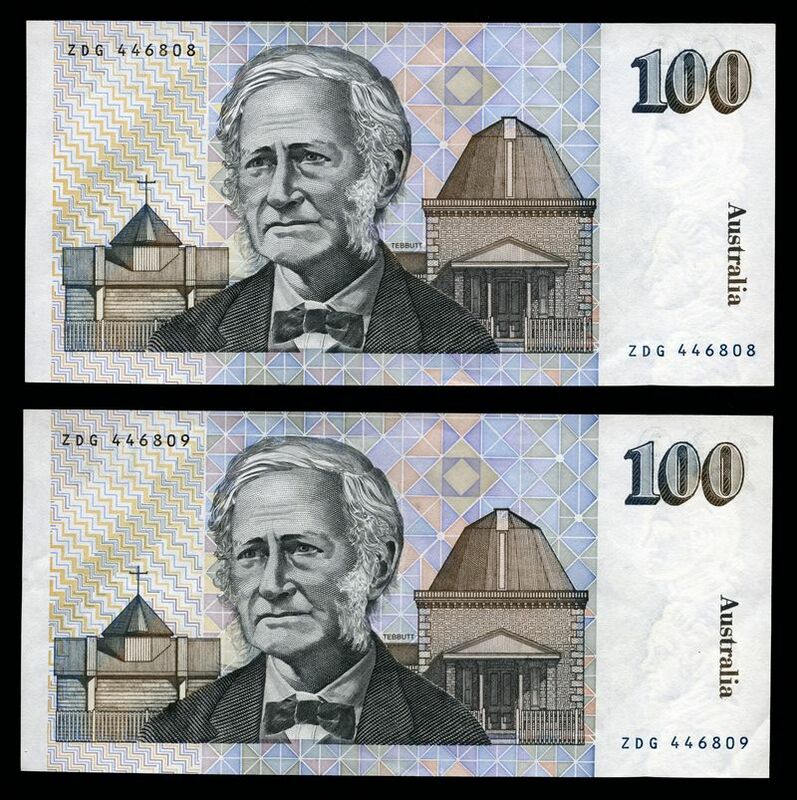 1992 $5.00 Two Note paper and polymer note Standard folder and 1993 $10.00 Two Note paper and polymer note Standard folder. McDonald $5F/LF2 and $10F/LF2. Also 1995 End of WWI Anniversary (2), 1998 Bass and Flinders (2), 2005 Australian Tennis Open, 2005 Queen's Baton Relay, 2006 Commonwealth Games, 2007 Bounding Kangaroos and 2008 Football Coin and Stamp PNC First Day Covers. 1988 $10.00 Bicentennial Polymer First Prefix 10 First release banknote Unc. Serial No AB 10949019. Catalogue Value $1,000.00. 1988 $10.00 Bicentennial Polymer First Prefix 10 First release banknote aUnc. Serial No AB 10949439. Catalogue Value $675.00. 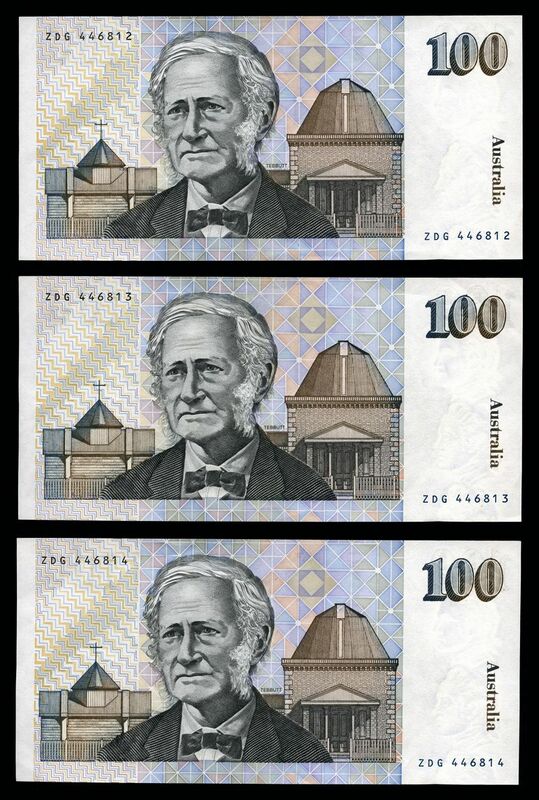 1988 $10.00 Bicentennial Polymer First release consecutive run of 4 banknotes Unc. Serial Nos AB 32 961785 - AB 32 961788. Retail $280.00. 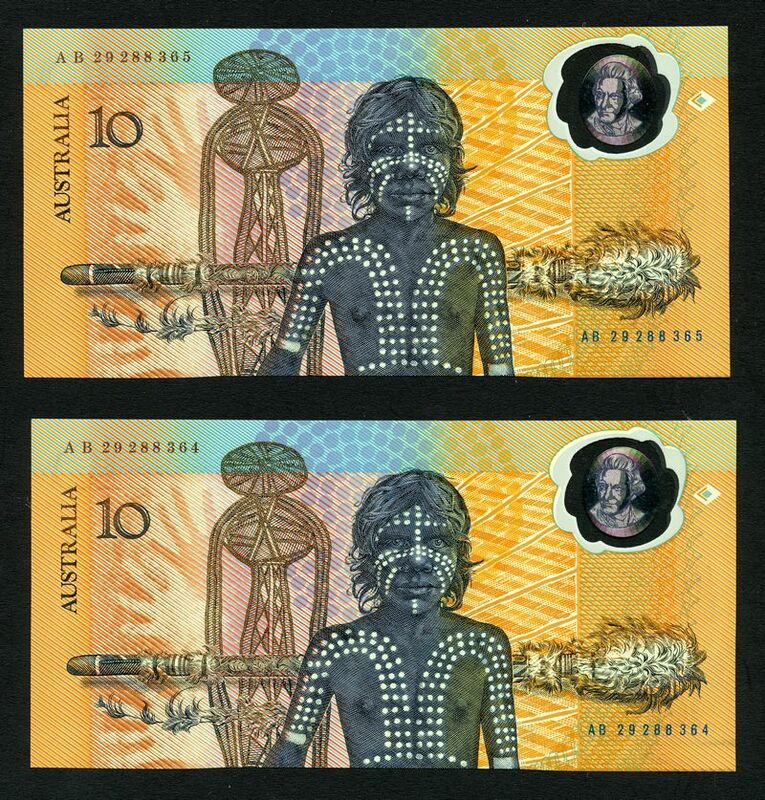 1988 $10.00 Bicentennial Polymer First release banknotes (11) aUnc/Unc including numerous consecutive. 1988 $10.00 Bicentennial Polymer First release consecutive run of 13 banknotes Unc. Serial Nos AB 32 961839 - AB 32 961851. Retail $910.00. 1988 $10.00 Bicentennial Polymer First Prefix 10 Second release banknote aUnc. Serial No AB 10300534. Catalogue Value $360.00. 1988 $10.00 Bicentennial Polymer First Prefix 10 Second release banknote VF. Serial No AB 10076699. Catalogue Value $125.00. 1988 $10.00 Bicentennial Polymer Second release last prefix AB 57 banknote VG/F. McDonald 174b/2. Catalogue Value as F is $250.00. 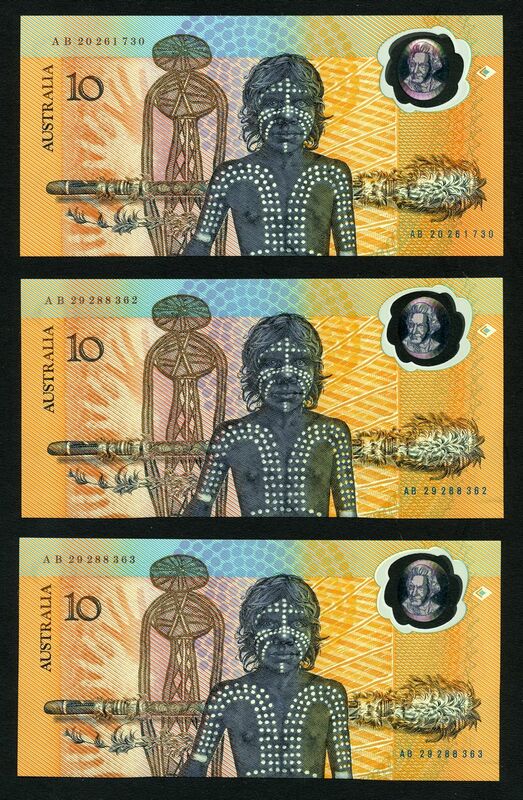 1988 $10.00 Bicentennial Polymer Second release banknotes (11) Unc including numerous consecutive. Retail $500.00. 1988 $10.00 Bicentennial Polymer Second release banknote VG/F. 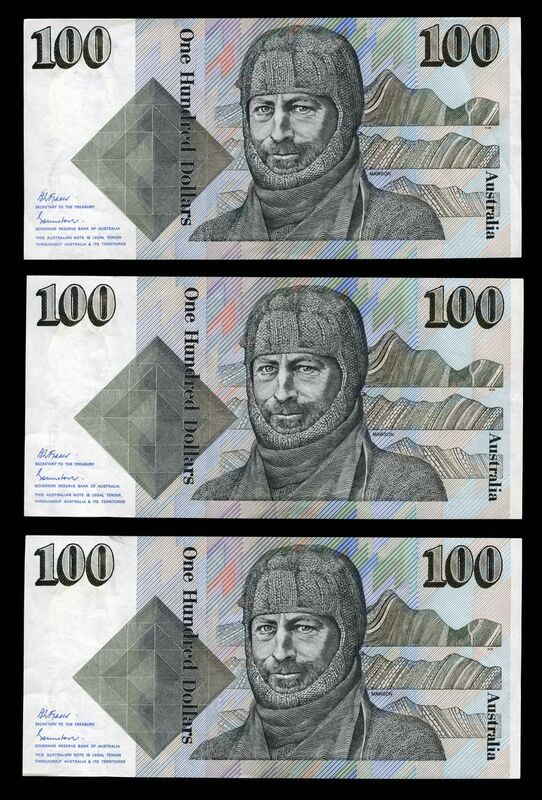 With a serial No of AB 43 943311, this second release banknote has 3rd and 4th digits normally seen on first release banknotes. 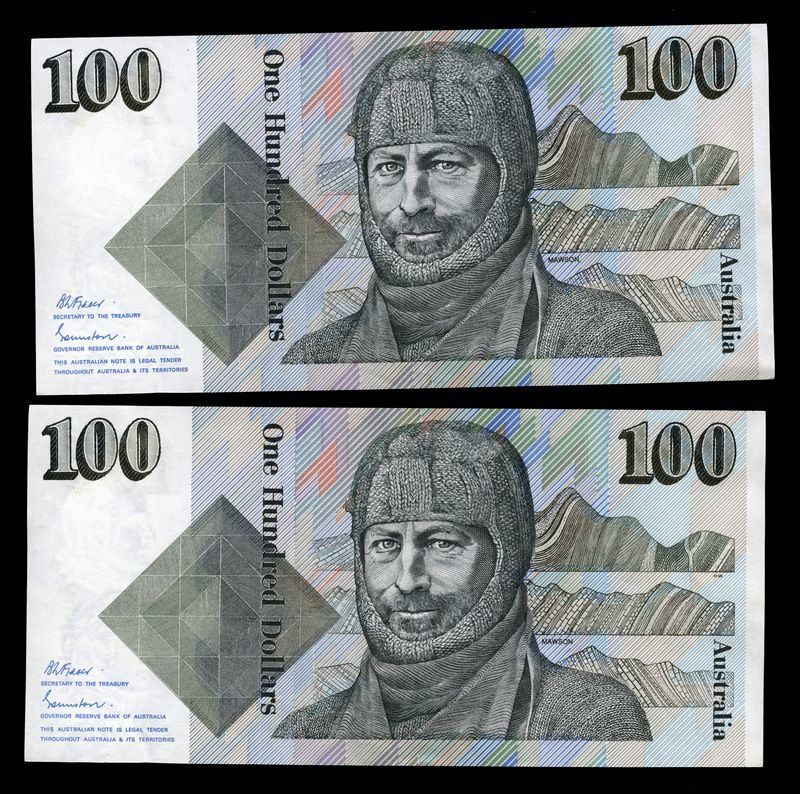 Scarce on a second release banknote. 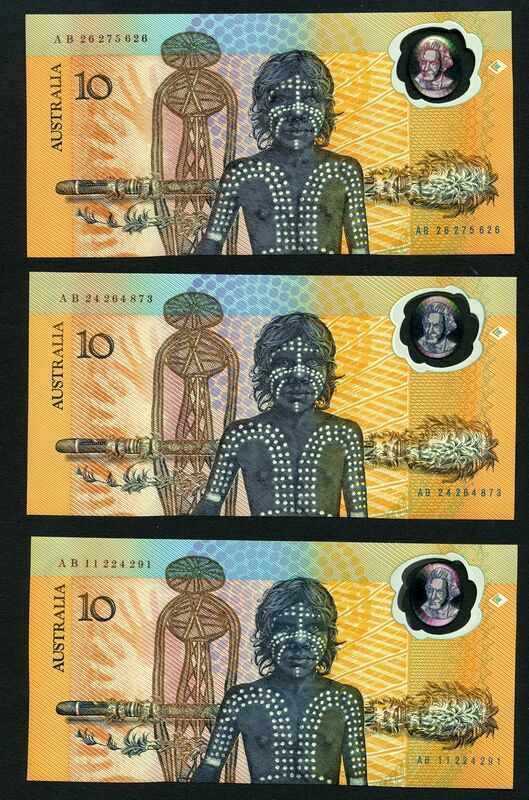 1988 $10.00 Bicentennial Polymer banknote folders (10) including numerous consecutive. Some have no outer envelopes. Catalogue Value $650.00. 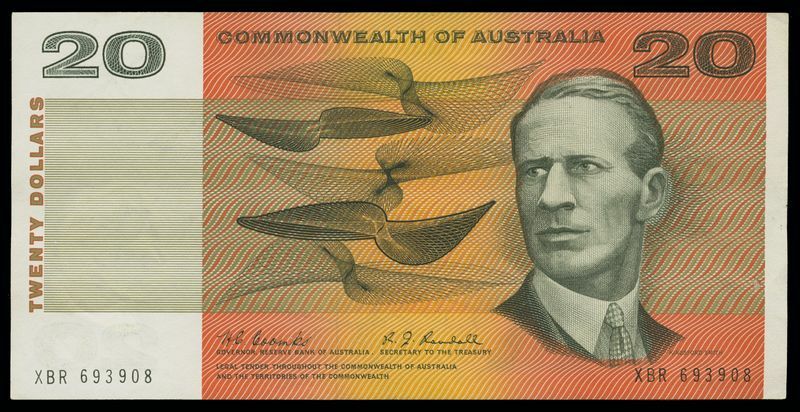 1967 $20.00 Coombs/Randall banknote good EF. Serial No XBR 693908. McDonald 182. Catalogue Value $2,600.00. 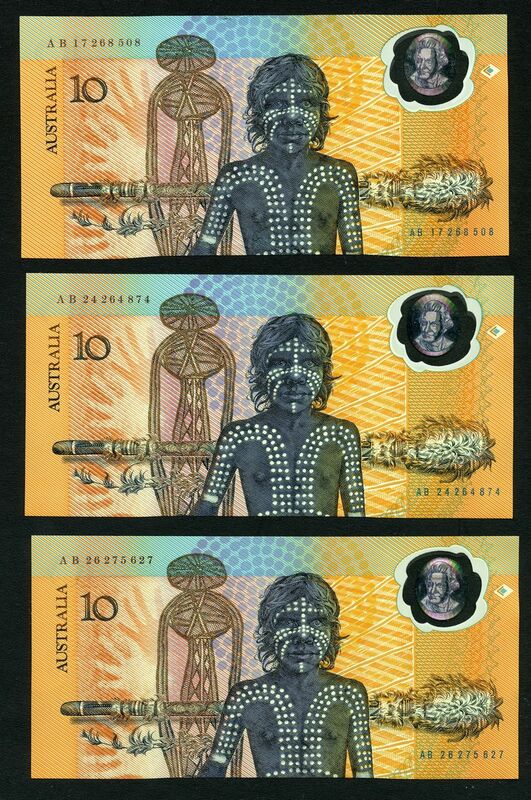 1994 Hargraves Centenary, 1996 Thirty Years of Decimal Currency and 1999 Maritime Heritage portfolio's with Black serial numbers. McDonald N/APT 6, 12 and 18. Catalogue Value $435.00. 1999 Maritime Heritage limited edition portfolios containing $20.00 Polymer note and 45¢ Polly Woodside pane of 10, (2, one with Red Numbers and one with Black Numbers). Serial numbers MH 203 and 2856. Also 1988 Bicentennial Coin and Note collection containing $2.00, $5.00 and $10.00 coins, $2.00 and $5.00 Paper notes and $10.00 Polymer note in presentation folder. $2.00 Last Prefix number LQG 962431 and $5 Serial number QAH 010731. Catalogue Value $505.00. 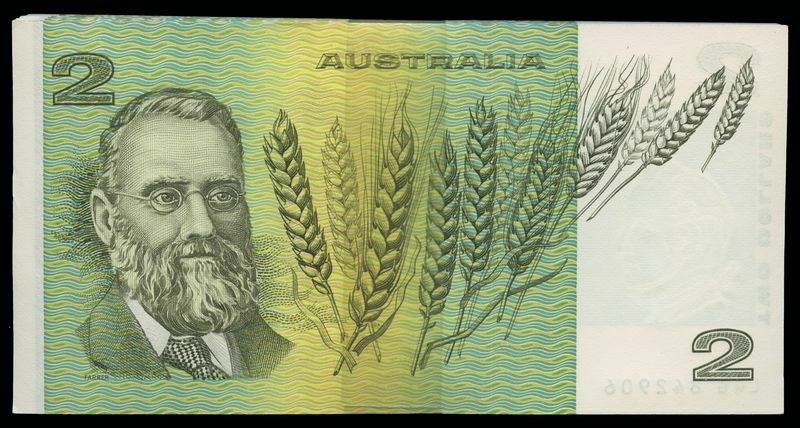 2004 $50.00 Macfarlane/Henry First Prefix AA 04 Polymer Banknote Unc. Serial No AA 04 462471. Catalogue Value $180.00. 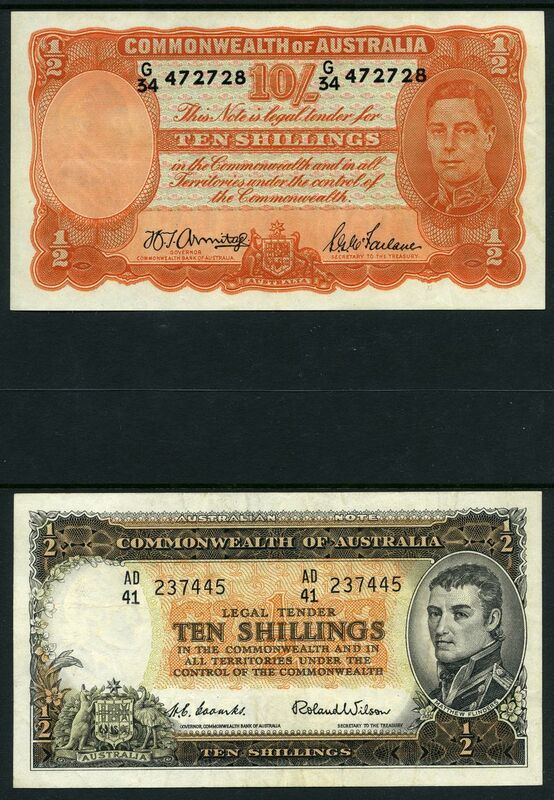 1985 $100.00 Johnston/Fraser consecutive pair of Paper Banknotes good EF. Serial Nos ZDG 446817 - ZDG 446818. 1985 $100.00 Johnston/Fraser consecutive pair of Paper Banknotes good EF. Serial Nos ZDG 446808 - ZDG 446809. 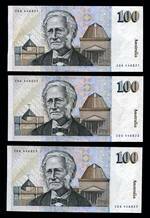 1985 $100.00 Johnston/Fraser consecutive run of 3 Paper Banknotes good EF. Serial Nos ZDG 446812 - ZDG 446814. 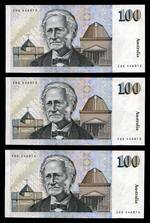 1985 $100.00 Johnston/Fraser Paper Banknotes EF/good EF. (3). 1996 $100.00 Fraser/Evans AN96 First Prefix Polymer Test Note EF. 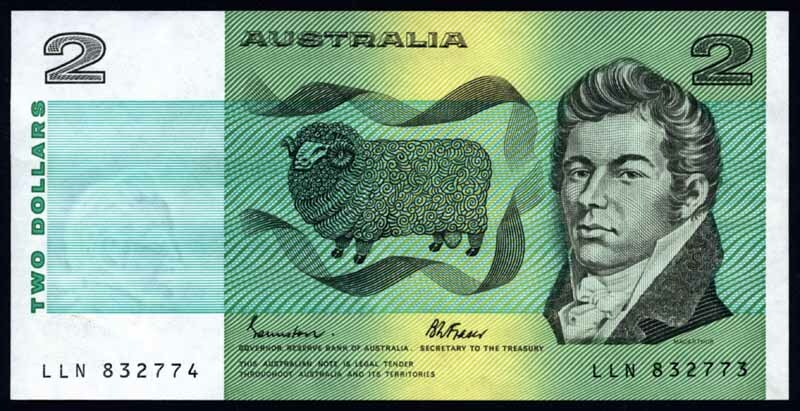 Has a small printing error on Dame Nellie Melba's head, where some printing is omitted. Serial No AN 96 849319. Renniks R616TF. Catalogue Value $1,000.00. 1996 $100.00 Fraser/Evans General Prefix Polymer Test Note UNC. Serial No BQ 96 663348. Renniks R616T. Catalogue Value $1,000.00. 1996 $100.00 Fraser/Evans General Prefix Polymer Test Note UNC. Serial No CP 96 995609. Renniks R616T. Catalogue Value $1,000.00. 1996 $100.00 Fraser/Evans General Prefix Polymer Test Note UNC. Serial No BD 96 115432. Renniks R616T. Catalogue Value $360.00. 1996 $100.00 Fraser/Evans General Prefix Polymer Test Note UNC. Serial No CM 96 033962. Renniks R616T. Catalogue Value $360.00. 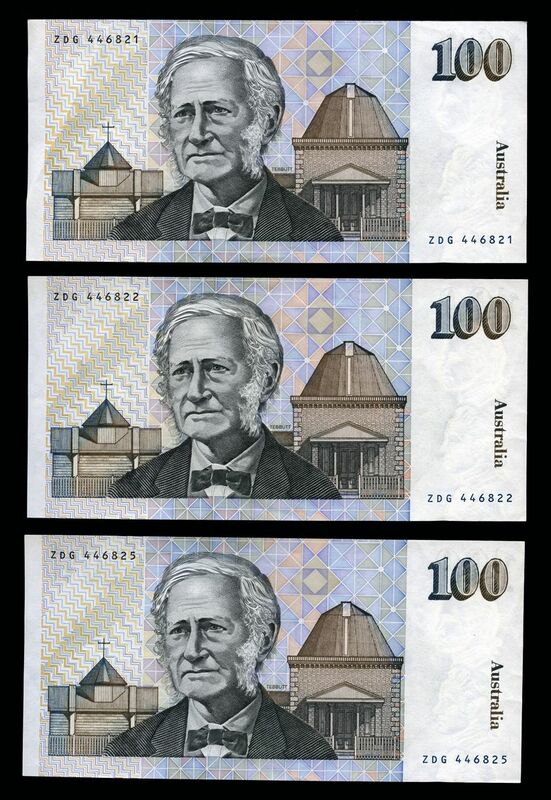 1996 $100.00 Fraser/Evans Polymer Banknote aUnc. Serial No DM 96 959455.